I did it. One month down. 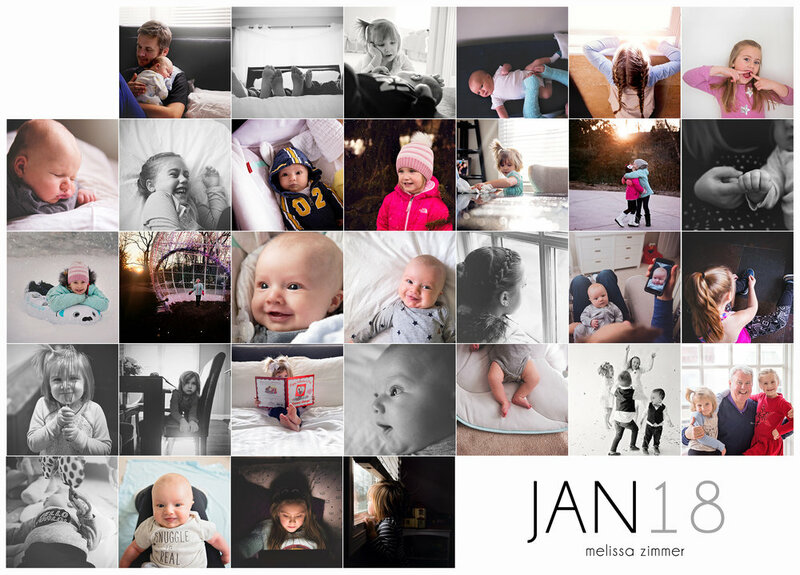 And I'm loving my images this year. I can see O growing up before our eyes and it's a whirlwind of emotion. From my first click on January 1st, to my last picture of him on January 29th, it's clear he's grown tremendously in both the physical and cognitive sense. My last baby, growing up before my very eyes. This project has also highlighted how grown up my girls are. It feels like yesterday that E was cooing her way into our hearts and D was crawling around in diapers, but the reality is that was quite a bit longer than I realize. How grown up does D look watching her iPad? And E is never shy about letting her true emotions shine through. I'm challenging myself to get out of the house with my camera in February. Start taking the kids on more adventures, because if I've realized anything this past month it's that time goes to quickly. These moments are the ones I want to remember when these three are all grown. In less sentimental notes - I realized I couldn't find a good template to showcase my images so I decided to create my own. And since I'm super awesome, I'll share it with you as a free download for everyone also on the Project 365 journey. Just leave me some love in the comments below. Click on the image below to start the download.